AAAA records store 128-bit Internet Protocol version 6 (IPv6) addresses that do not fit the standard A-record format. For example, 2001:0db8::85a3:0000:0000:6a2e:0371:7234 is a valid 128-bit/IPv6 address. It maps the host name to an address associated with a domain name and specifies that AAAA records must be processed. 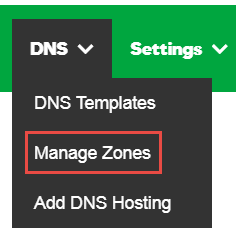 On the DNS Management page, at the bottom of the Records section, click Add and select AAAA from the menu. Name - Enter the host name or domain name that links to this AAAA record. Value - Enter the 128-bit address.